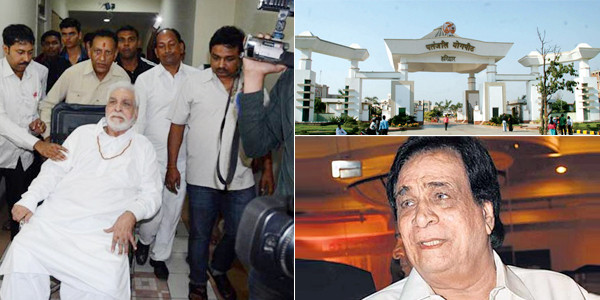 Eminent Bollywood actor and famous dialogue writer Kader Khan, who is making his comeback with the movie HOGAYA DIMAAG KA DAHI this Friday on October 16 alas, instead of attending the premiere of the film has landed himself in hospital due to his acute diabetes. Directed by debutant director ‘Fauzia Arshi’, HOGAYA DIMAAG KA DAHI stars many veteran comedians like Om Puri, Sanjay Mishra, Raajpal Yadav, Razak Khan, Amita Nangia Vijay Patkar and above all Kader Khan. The veteran actor arrived at Dehradun Jollygrant airport, along with his son Shahnawaz, on Wednesday and later headed to Ramdev Baba’s Patanjali Yogpeeth ashram in Haridwar. He was given a warm welcome by the associates of Patanjali Yogpeeth ashram and Baba Ramdev’s associate Acharya Balkrishna personally guided him. It may be noted the ayurveda and naturopathy are becoming quite popular among Indian people. Readers may recollect that earlier Delhi Chief Minister Arvind Kejriwal too got his persistent chronic cough problem treated at the famous naturopathy institute of Jindal Nature Cure Institute on Tumkuru Road on city outskirts of Bengaluru. It’s really good a sign for our country because if celebrates starts treating themselves in ayurveda and naturopathy than not only the economy of India will see a boost but even the Indian Medicine and Homeopathy (ISM&H) will get a new lease of life!